The Rossoneri’s “downward spiral” continued as they were beaten by the struggling side and have not won in six games. AC Milan head coach Gennaro Gattuso. AC MILAN BOSS Gennaro Gattuso slammed his side’s lack of spirit while sporting director Massimo Mirabelli was left “ashamed” by the shock 1-0 home loss to bottom-placed Benevento. Pietro Iemmello’s calm first-half strike condemned Milan to a sixth successive Serie A match without a win, a run that leaves them vulnerable in sixth and at risk of missing out on a Europa League qualifying spot. Benevento had substitute Cheick Diabate sent off for a second yellow in the 80th minute, but the rank outsiders held firm to secure their first top-flight away victory in a result that mirrored the teams’ 2-2 draw in December, which marked Gattuso’s maiden match in charge of Milan. And while the club’s former midfielder enjoyed an upturn in results at the turn of the year, he has now questioned his squad’s character and desire. “It’s clear to see the team is on a downward spiral. When you play without soul you get embarrassed like this,” Gattuso told Mediaset Premium. “It doesn’t matter if we play with two, three or four strikers, because we don’t have the psychological strength to do anything. We basically tickle the opposition, we don’t hurt them. Mirabelli echoed Gattuso’s anger over a result which could see Milan drop out of the top six as soon as Sunday, a position which would leave them needing to beat Juventus in next month’s Coppa Italia final to secure European football. “We must apologise to the fans for this defeat. With all due respect to Benevento, Milan should not have lost this game,” Mirabelli said. “We are ashamed of this performance, but must not let ourselves become distraught. When you change so many players in a season these things can happen. 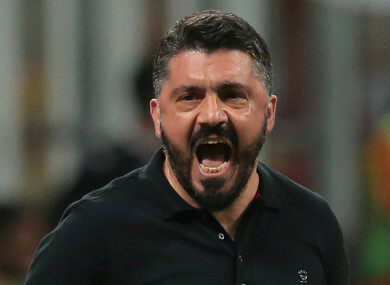 Email “Gattuso 'embarrassed' by 'soulless' AC Milan in loss to bottom-placed Benevento”. Feedback on “Gattuso 'embarrassed' by 'soulless' AC Milan in loss to bottom-placed Benevento”.